What happens when a head-to-head competition between two similar products is joined by a third contender with a highly credible shot at grabbing market share? Things get interesting. Pine’s Scimark Report has long been the industry go-to source for research and analysis of short-form DRTV advertising. In his March report, Pine analyzes the battle between two spinning scrub products: Hurricane Spin Scrubber and Turbo Scrub, offering insights into the various elements that could potentially give each product an edge. 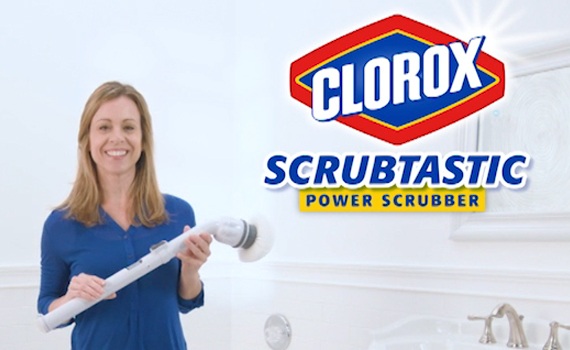 The article climaxes with the introduction of a third contender: Clorox Scrubtastic! Calling the Hutton Miller commercial for Scrubtastic “the best of the three commercials,” Jordan Pine has officially rung the bell for Round 2. Ladies and Gentlemen: let the games begin! We always enjoy reading Jordan’s articles and are honored to receive his favorable opinion. We believe in all of our products and are proud that Emson gave us the opportunity to represent Clorox, a time-honored brand. Competition breeds excellence and we’re pleased to be in good company with our peers in the industry. May the best brush win!